4) Combine flour, salt and the remaining sugar. 5) In the large bowl or bread machine bucket pour in the yeast and flour mixture, butter, shortening, the flour mixture lastly add the egg. Turn the bread machine on to knead the dough. If using your hand to knead the dough, knead the dough until it is smooth and elastic. Then transfer the dough into a large greased bowl and cover it for 2 hr. If you using a bread machine leave the dough in the bucket and let it rise for 2 hr. 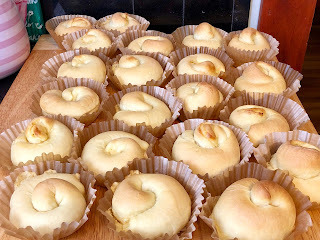 8) Flatten each dough 1/4 inch thick and about 8 inch long then add the filling about 1 tsp the roll into a long and pinch the side to sealed. 11) Let it cool down completely. Once it is cooled completely take another 1 tsp of yema filling and spread it on the top of baked essaymada and top it with your favorite cheese. Store it in the air tight container or wrap it individually using a plastic wrap. 2) Combine the egg yolks and the granulated sugar beat until its pale yellow color. 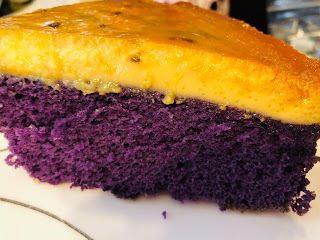 Add in the ube halaya and beat it again until the ube is well combine to the egg yolks mixture. 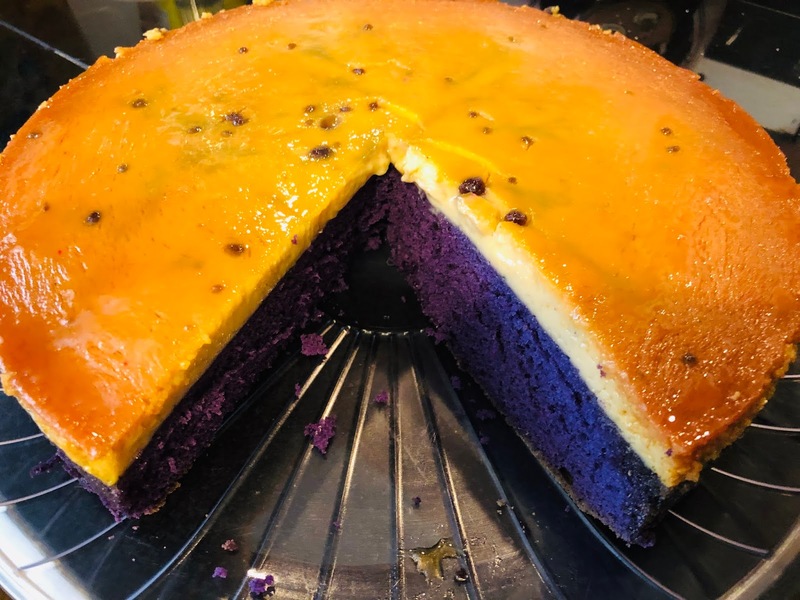 3) Combine the liquid ingredients the oil, milk, ube flavoring, water and the food color give it a whisk then add it to the egg yolks mixture. 4) Combine the dry ingredients flour, baking powder and the salt and sift it to the wet mixture and beat until its just combine. 5) Beat the egg whites until it is frothy once it is frothy gradually add the sugar and continue to beat until you get the stiff peaks stage. 6) Combine the batter and the meringue in 3 addition and using a spatula do the cut and fold method. 7) Divide the batter into 2 as equal as possible into the prepared cake pan and bake it for 25-30 minutes or until toothpick insert comes out clean. 8) After baking let it cool down in a cooling rack. Turn the cake pan upside down do not remove the cake pan when cooling it. 9) Remove the cake from the cake pan and peel of the parchment paper. Level the cake using a serrated knife use the 8"of cake board or if you don't have one just use a plate. 10) Using a decorating bag filled the bag with icing and cut the tip and pipe a line of icing just inside the outer edge of the layer And add half of the macapuno filling. add another 1/2 cup of the icing in top of the macapuno and spread/flatten using a spatula now add the other cake upside down. 11) Ice the whole entire cake with icing start from the top down to the side. Once the entire cake is covered with the icing. Fill another piping bag with icing and use 1M piping tip to make rosette or a swirl and in the bottom pipe a shell around the side. and add the cherry on the top of the swirl/ rosette let is set the the fridge for few hours before serving what I did is I took 1/2 of the white icing before I add the ube flavoring and the food color but that is optional. 1) Prepare 10x2 Cake pan. Melt the 1 cup sugar you can melt it straight to the cake pan or you can use heavy pot like I did. Melt the sugar until it turn into caramel. If your melting your sugar using pot then once the sugar turn into caramel transfer it right away into the cake pan and set it aside. 2) Make the Flan. In a large bowl whisk in the egg yolks and the sugar until its just well combine DO NOT over beat. Add the condensed milk, evaporated milk and the vanilla or rind stir and strain it into the prepared baking pan and set it aside. 4) Make The Cake. Beat the egg yolks and the sugar until its pale yellow color, add the ube and beat until its well combine. 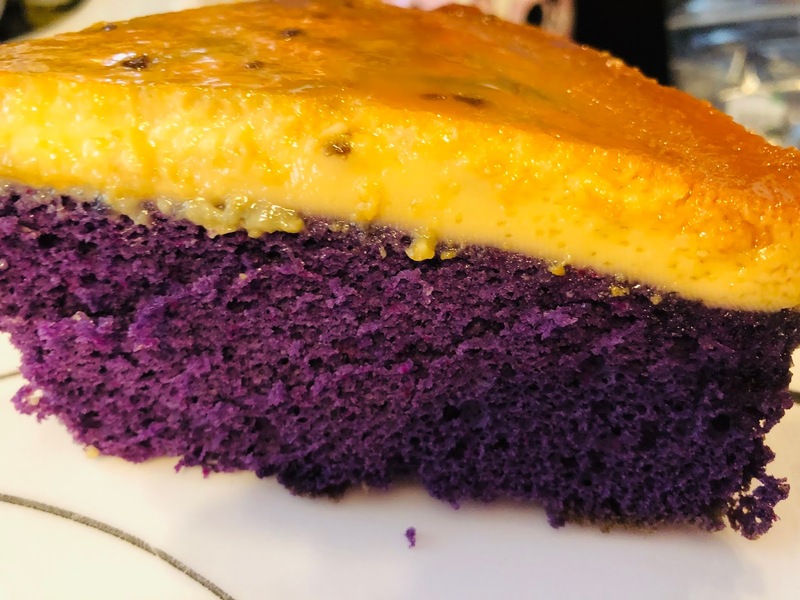 5) Combine the milk, oil, ube flavoring and the food color. Add it into the egg yolks mixture. 6) Combine the cake flour, salt and the baking powder. Sift in to the wet mixture and beat until its just combine. 7) Make the meringue. Combine the cream of tartar and the egg whites and beat until it is frothy. Once it is frothy gradually add in the sugar continue to beat until you reach the stiff peaks stage. 8) Add the meringue into the batter in 3 addition and mix using the cut and fold method. 9) Pour the batter over the flan and bake it in a water bath 350 oven for about 1hr and 15 minutes half way through baking tint it with aluminum foil. 10) After baking let it cool down for about 15-20 minutes before transferring it into a serving dish or a cake stand run a stainless spatula around the edges of the cake and flip it upside down. Put it inside the fridge so the flan can set before serving. 2) Line 24 muffin tin with aluminum cupcake liner or any nonstick cupcake liner. Spray with nonstick baking spray if using aluminum. 3) In a large bowl combine grated cassava, sugar, melted butter, evaporated milk, condensed milk, coconut cream, and eggs. mix well until sugar is dissolve. 4) Add/pour 1/4 cup of the mixture into prepared cupcake pan bake it for 40-45 minutes. After baking remove it from the oven and add 1-1/2 tsp toppings on each cassava. Put it back in the oven and bake it for additional 20 minutes and broil it for 5 minutes to have a nice golden brown tops. 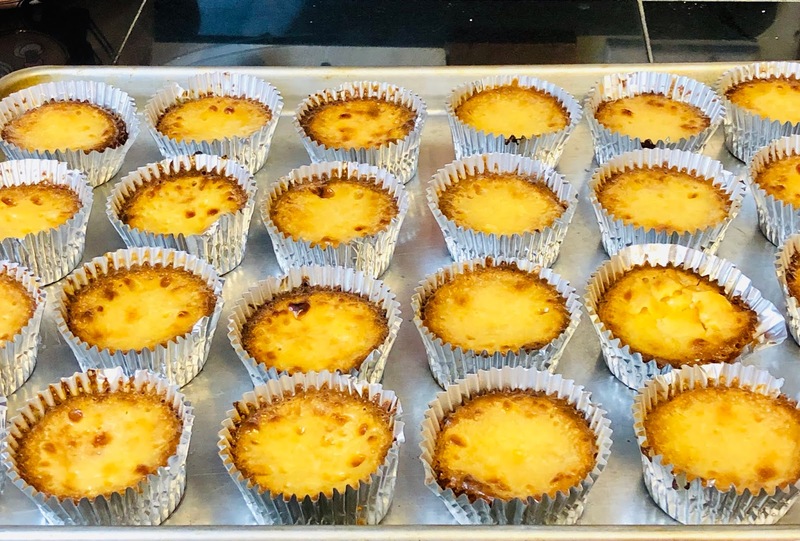 this cassava cake has softer texture.